It had to have been a little unnerving for 20-year-old Alexander Zverev in Montreal this past Saturday night to look across the net and see that his semifinal opponent, Denis Shapovalov, was even younger. Such is the generational saga of tennis. One minute a player like Zverev is the precocious one, out to take down his elders. And then, along comes an 18-year-old who swings freely and fully engages the crowd. Suddenly, Zverev had become the experienced veteran. 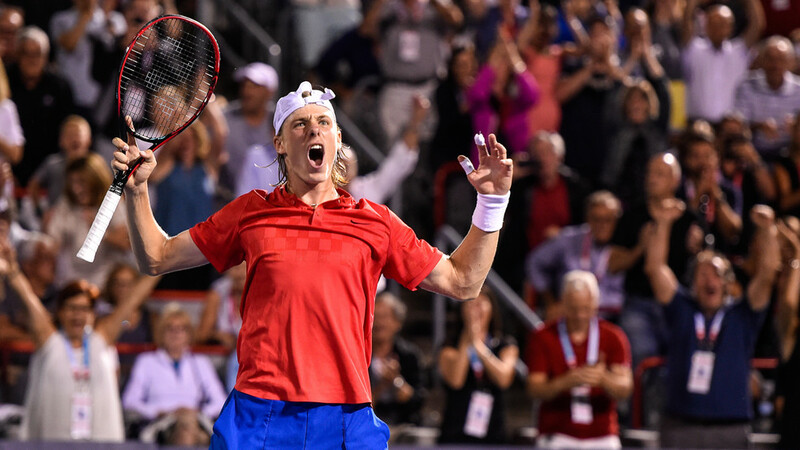 Though he would beat Shapovalov by the narrow score of 6-4, 7-5 and the next day beat Roger Federer to win the tournament, in large part the big story of Montreal was the emergence of Shapovalov. Shapovalov’s playing style is a breath of fresh air. Like many lefthanders, he wants to create – angles, openings, ideas, big shots, both off his crushing forehand and his distinct one-handed backhand. Also true to southpaw form, he has a whip-like serve that slithers into all sorts of awkward places. And it was an improvised drop volley that saved a match point in his opening round match versus Rogerio Dutra Silva. In other words, this is a man with plenty of potential to vex his opponents and bring a new sparkle to contemporary tennis. "I'm most proud of my fighting spirit," said Shapovalov during Montreal. "If I don't save those match points in the first match, there's no chance of being here. I think just having to battle every day. I've had several tough matches. Just getting through it every day, it's really motivating. "And the crowd was ridiculous. I've never been in a sporting event where the fans get so loud. It's so much fun to be a part of. It's so much fun having them cheer me on. Honestly, I don't think I could be in this position without them." Of course, that performance came in front of his fellow countryman, naturally eager to cheer on a homeland hero (or at least a hero in the making). Having now leaped from #143 to #67, Shapovalov now enters another world of private skill-building and public expectation. On the latter front, Shapovalov has already had some unfortunate but edifying exposure. In February, frustrated during a Davis Cup match, Shapovalov struck a ball in anger that accidentally hit the chair umpire in the eye. Immediately defaulted, Shapovalov rapidly took responsibility for his mistake and has since called it “the most maturing experience” of his pro career. Stay tuned for more from this promising teen.